The Dutch East India Company (see East India Company: Dutch East India Company), founded in 1602, competed with the Portuguese and the English for the archipelago’s trade. 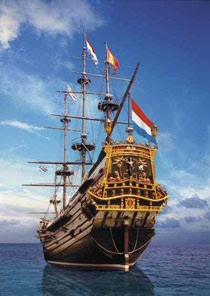 The Dutch governor-general Jan Pieterszoon Coen arrived on Java in the early 17th century and established Batavia (now Jakarta) as the Dutch headquarters. Through direct force and alliances with native leaders, Coen tried to stop the interisland network of traders from engaging in international trade. In 1629 the Dutch clashed briefly with Mataram, then settled into a period of coexistence. The Dutch captured Malacca in 1641, but Malacca no longer had complete control of the spice trade to Europe. To gain a trade monopoly, the company allowed cloves to be grown only on the island of Ambon and nutmeg and mace to be grown only in the Banda Islands. The company destroyed the spice trees in other places. In 1678 Mataram was forced to cede the Priangan region of western Java to the Dutch company. Britain occupied Java briefly (1811-1816) during the Napoleonic Wars. Both the British and later the Dutch tried to centralize and reform Java’s administration. The Dutch wavered between opening the area to individual enterprise and reverting to a monopoly system. From 1825 to 1830 the Javanese prince Diponegoro led a guerrilla revolt against the Dutch. The wars, which left as many as 200,000 dead, cost the Dutch huge sums of money and they ultimately decided for a government monopoly. The Dutch annexed large areas of central Java and in 1830 introduced the Culture System, under which peasants had to devote part of their land (officially one-fifth, but usually far more) to cultivating government-designated export crops instead of rice. Extremely profitable for the Dutch, the system was blamed for widespread famine in parts of Java in the 1840s and 1850s. In the mid-19th century Dutch liberals campaigned against the Culture System, and by the 1870s some of the system’s harshest aspects were removed. The new Liberal Policy gave farmers more freedom to grow crops they wanted. Oil, tin, and rubber later began to replace coffee, sugar, and tobacco as the main exports to Europe. These products came largely from outside Java, and the Dutch took control of the islands where they were produced. In the late 19th century the Dutch were engaged in a 30-year war with Aceh and Bali, which ended in 1908 in the former and 1909 in the latter. By this time, Sulawesi, the Moluccas, the Lesser Sunda Islands, and most of Borneo had also been brought under firmer Dutch control.